Jen's mom says that grilled meats give her nightmares. It's not that she doesn't like grilled meats, it's just that she's conducted a scientific experiment and determined that every time she's consumed grilled meats in the past year-and-a-half she has had nightmares. I know this because Jen's mom and sister Lauren were in town to visit us. Unlucky for her mother I only discovered this nightmare information after I'd purchased all the ingredients for a mega-grilled dinner. 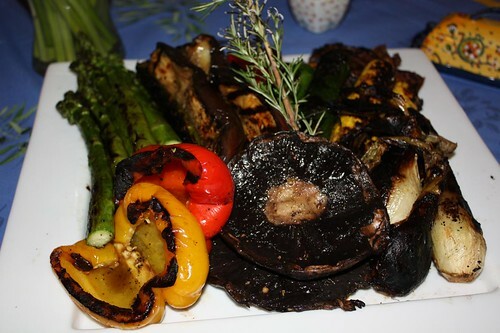 I started by grilling some eggplant, zucchini, summer squash, spring onions, treviso, red and yellow peppers, portobella, and asparagus. I was assured that this was not a problem as vegetables did not contribute to any uneasy dreams. Scientific data was cited from Diane's experimentation journal. A month ago Jen and I compiled a list of all the things that we wanted to grill this season (now that we actually could). I think I might have knocked most of them off the list in one dinner. 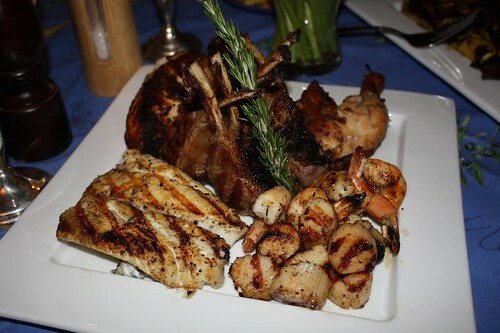 I grilled up a half chicken, a nice fillet of halibut, scallops, shrimp, and an entire rack of lamb. 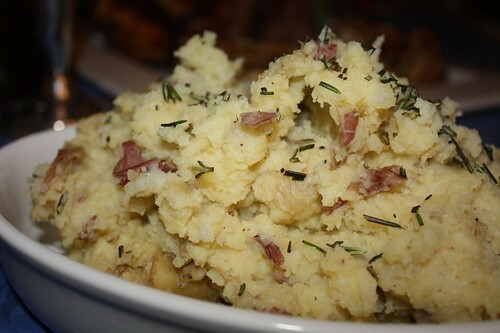 Lauren made the mashed potatoes. We used yukon gold and red bliss potatoes with the skins on. Lauren refused to use the delicious Kerrygold Irish butter because she is suspicious of butter from another country. I'm not exactly sure what she expected the major difference to be in a butter made from Irish cows versus American cows but I humored her and allowed her to use only the American butter in the fridge. 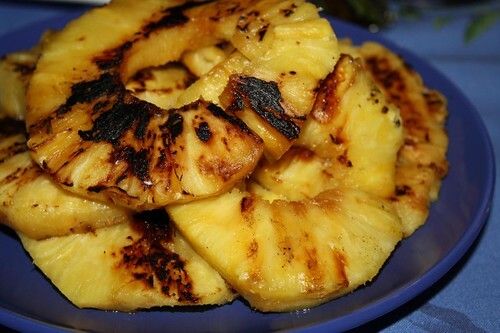 I even grilled an entire pineapple as if all the rest of this weren't excessive enough for a meal for four. 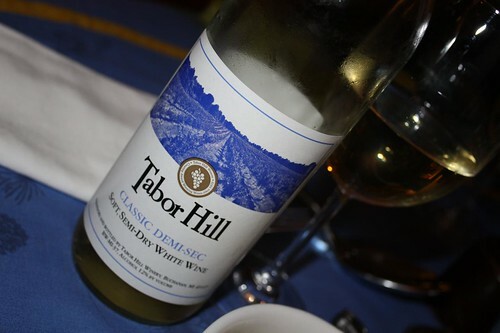 We opened a bottle of the Tabor Hill Classic Demi-Sec from Michigan for dinner. This is the wine they serve at the White House! It's a very tasty wine but extremely sweet. I stuck to beer throughout the meal. Now it's just a waiting game to see if Jen's mom has nightmares tonight. With the vegetarian and her mother out of town, I took advantage of the occasion by butterflying a nice leg of lamb. I stuffed the leg with a hummus, roasted red peppers, pinenuts, chevre and swiss chard. Grilled it over oak and hickory. Rickards Red and Sleeman's IPA while grilling, a red from Nimes that went well with the lamb. I am thinking no nightmares here, just very sweet dreams. Sounds good to me! That would give me sweet dreams too. Just for the record: Diane still had nightmares last night. Probably had nothing to do with what you made, sounds delicious. More likely Diane had nightmares about me eating the wonderful lamb. The most I could get out of her was, "This doesn't taste very lamby at all!" But that only resulted in about one-and-a-half half-hearted bites of her lamb chop. I think a trip to a Gastro-psychologist is in order. You know, if such a thing existed.